The issue: You’ve accumulated a sizeable Notes® estate, and wading through the results is time-consuming, complicated and frustrating. The solution: The CIMtrek Discovery and Analysis Bot (CIMtrek DNA). This robotic process enables users to gain clear insights into - and understanding of - their installed Notes estate in a matter of hours by accessing the Domino servers to provide a complete list of every NSF file. This cuts significant time and costs before beginning the migration process from your IBM® Lotus Notes® applications to new environments. As the first of two options, "Quick Discovery" provides an overview snapshot of all of your NSF files on the selected server. This includes the application title, file name, size and template used (if any). 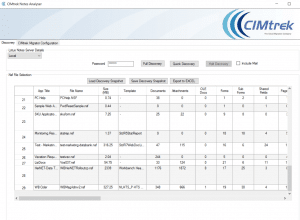 CIMtrek DNA also offers guidance on how complex your migration will be. By analysing the output, you can decide which applications are to be migrated, archived, replaced or discarded, and avoid migrating very complicated applications. The following screenshot offers a partial view of typical results. For a more detailed look, visit the Resources page.